Yesterday I was listening to Raf Epstein on ABC’s afternoon drive time radio. He was interviewing a tourist who was stuck in Bali due to the closure of Ngurah Rai airport in Bali as ash continues to pour from the erupting Mount Agung, Bali’s most prominent active volcano. Like many other tourists whose flights have been cancelled, this chap wasn’t too perturbed. He sounded jolly, amused even and serene. He was sitting by the pool eating chicken. 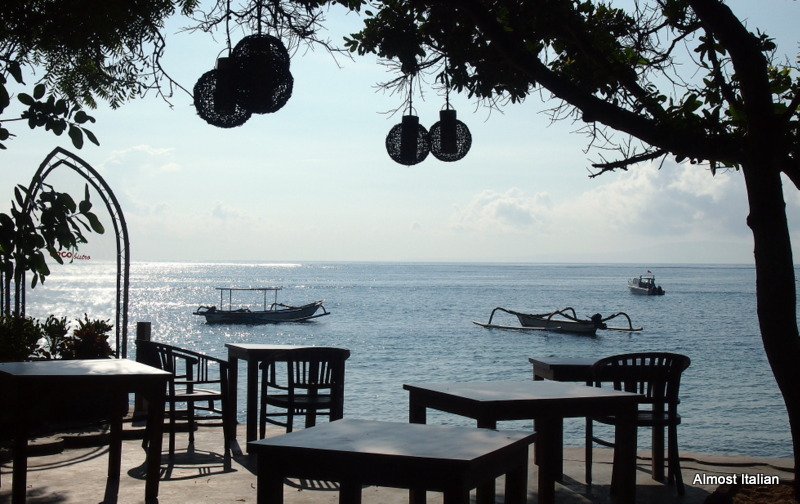 A few more weeks in Bali with glorious weather and tasty Balinese food- what’s not to like. Raf made no mention, in this instance, of the significance of Mt Agung’s eruption to the lives of the Balinese people. It was all a bit of a joke really, ‘enjoy your chicken by the pool’ was Raf’s closing comment. It’s a similar story in the Australian press. Pictures of closed airports, or tourists milling about as airports open once again with only occasional glimpses into the lives of those hugely affected- the Balinese people. While Mt Agung makes up its mind, 44,000 people have left the danger zone and are waiting. Many more thousands have returned to the exclusion zone to tend their cattle and farms. The Balinese economy is fragile: despite the lush fertility of the country, farmers live a very simple subsistence lifestyle. Those who have returned have had to weigh up the cost of continuing with their farms, crops and cattle with the threat of a possible disaster. What a choice! Meanwhile, the Balinese economy is completely dependent on tourism. For months now, many sectors have been affected. Those working directly in tourist industries, such as hotels, hospitality, transport, mountain climbing and adventure, have been without wages for some months. rare glimpse of Agung in the morning. Gunung Agung, a sacred mountain, is revered by the Balinese. When Agung is active and threatens to erupt, it indicates that the Gods are displeased and something in the world is awry. The Balinese have been praying, or counting their losses, or worrying about their homes and livelihood: meanwhile tourists will either kick back by the pool and rejoice in their lengthened holiday, will be checking their travel insurance policies to see how much they might be financially inconvenienced, or travelling by ferry to Lombok for another flight home. Life’s tough. It is always worth getting up early in Bali to sense what Nehru meant when he called Bali ‘The Morning of the World.” The warm air feels tender at 5.30 am. The scene is still: there is no noise, no gamelan or motorbike sound. Perhaps a rooster crows somewhere in the distance. No one speaks. A few souls gather along the edge of the water, to meditate and reflect, or to wake slowly, to witness. The joggers and bike riders have not emerged yet. On good mornings, Mt Agung peeps out from the veil of clouds to the west. 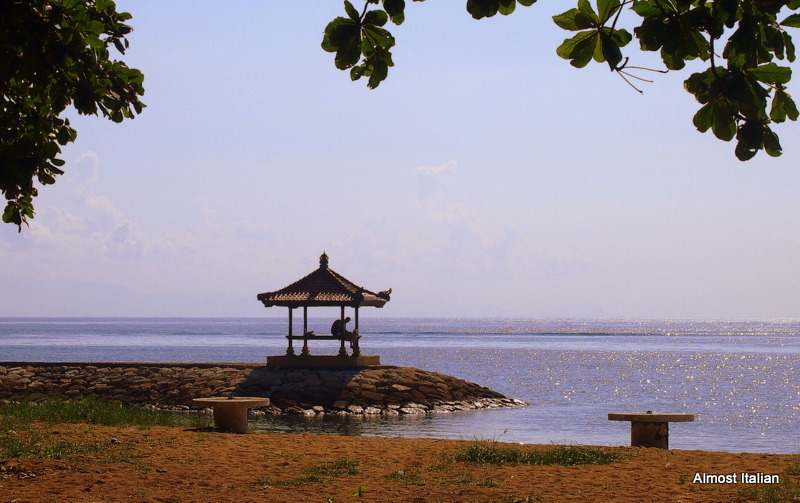 Guning Agung, Sanur, Bali. Very rarely seen at any other time of the day. 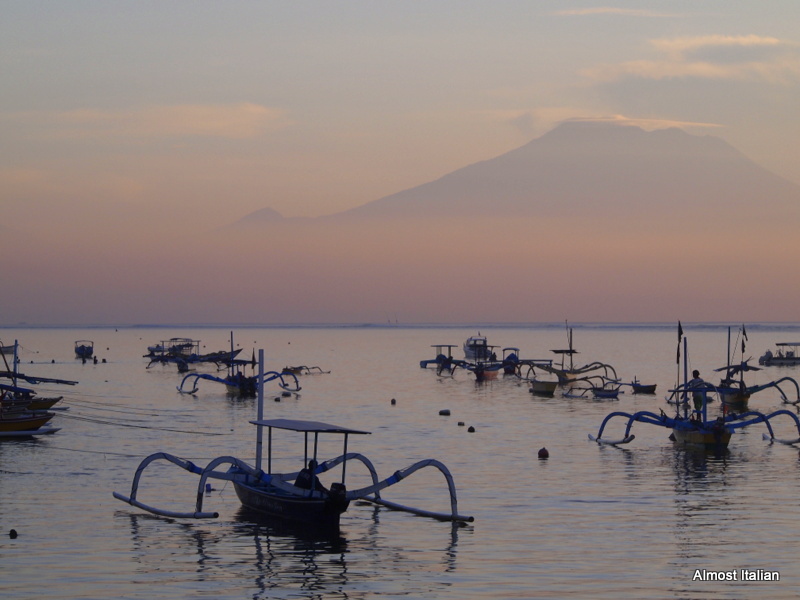 Dawn on Sunday and it’s all happening on Sanur Beach. There aren’t many tourists in sight- only Mr T and I, one western swimmer and a few expats walking their dogs along the beach promenade. But the place is packed and it’s wonderful to see. 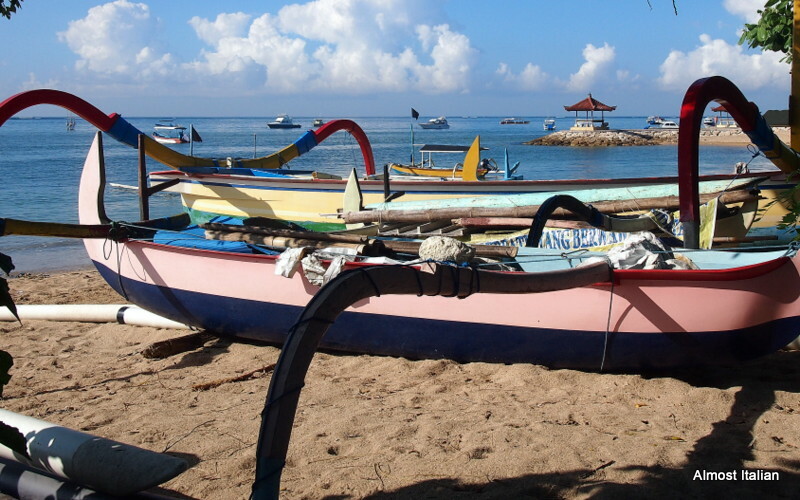 Sunday is the main holiday for Balinese and many family groups gather at the beach: some for traditional Hindu ceremonies, others to take a dip and a beach breakfast before the weather gets too hot. 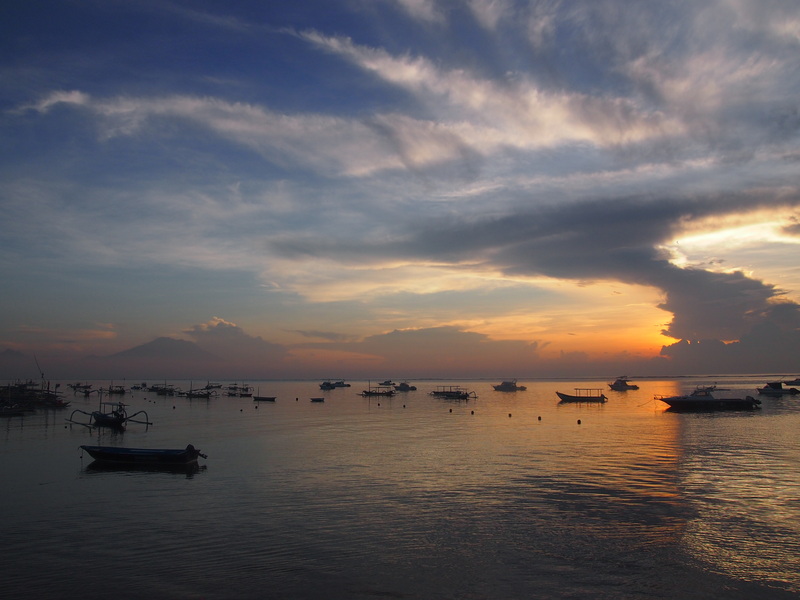 The beach is alive with activity as teams of cleaners sweep up leaves and rubbish, lone fishermen look for small fry to catch in nets, diving schools set up for the day as bemos deliver air tanks, and best of all, Gunung Agung pops out of the clouds and makes a majestic appearance. It was worth getting up early. 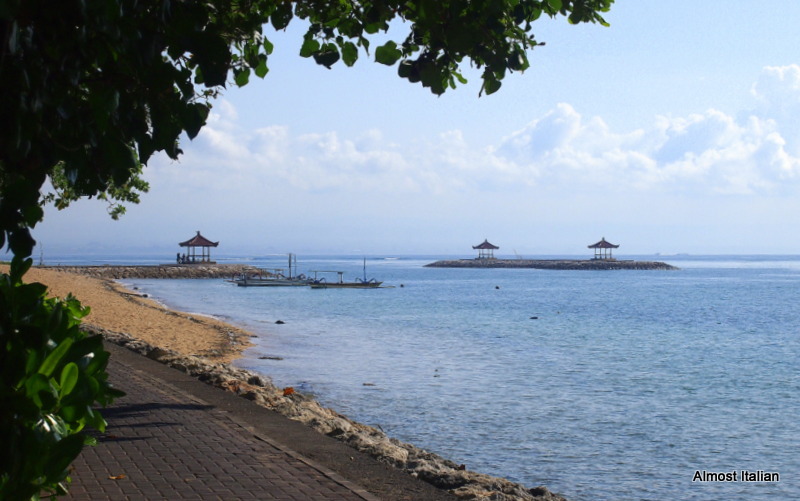 Morning is the best time to go walking, jalan- jalan, in Sanur, Bali. Walking along the beach front is a lovely ritual and one best done before the sun rises and the heat becomes too fierce. The pathway meanders for about five kilometres, with long stretches of deep shade provided by large Pohon trees. Along the way, picturesque Jukin are parked on the sand, colourful traditional Balinese outrigger canoes used for fishing or tourist jaunts; sunny sandy sections are lined with white beach chairs and umbrellas, beckoning those who are partial to frying, and shady beach restaurants, morning yoga schools and art markets begin business for the day. The large crunchy fallen leaves of the Pohon are swept away for another day. 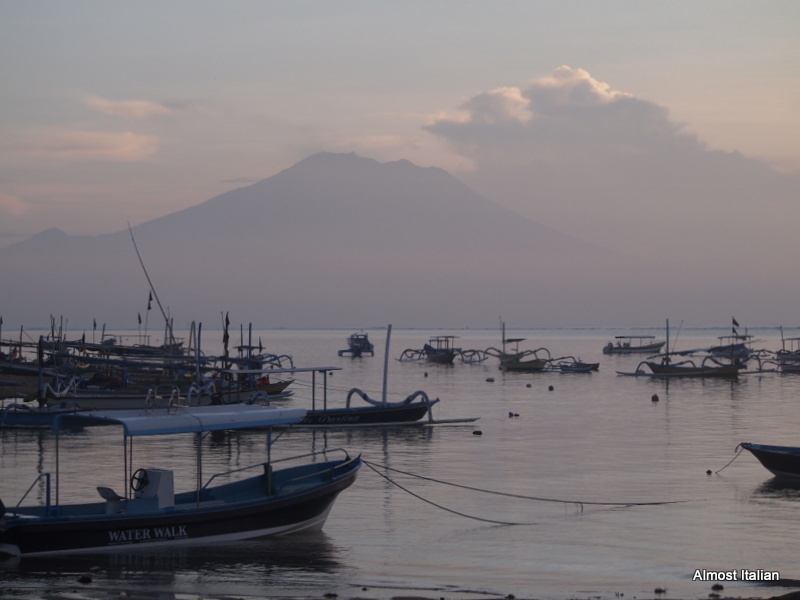 If you are lucky, Gunung Agung, Bali’s sacred mountain, may pop out of the low cloud on the horizon to greet you or the white cliffs of Nusa Penida will glow like silver in the morning sun. More rarely, Lombok’s 3276 metre high volcano, Gunung Rinjiani, will appear from across the Lombok Straight. 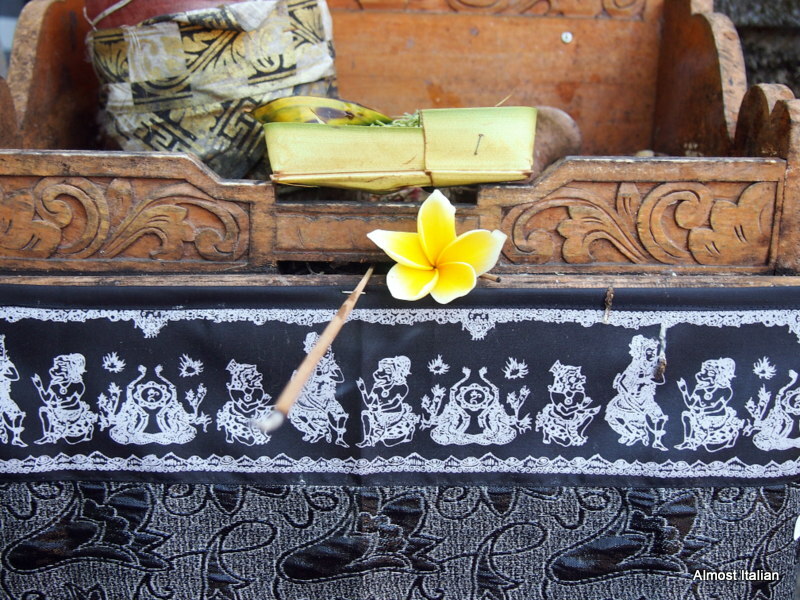 Waking in Sanur and walking this stretch of coast, I feel blessed to be back in the “Morning of the day”, especially as I watch the women carefully arrange their early morning offerings, Canang Sari, on small alters, Palinggih or in the larger Puri, district temples. A nod and a Selamat Pagi or Good Morning to all the locals at this early hour makes the day special. Although most of the locals know rudimentary English, I prefer to use my very basic Indonesian where and when I can. A buongiorno goes a long way in Italy and so does a selamat pagi here in Indonesia. At 8 am, you will meet uniformed security guards of large hotel compounds, beach sweepers and sand rakers, and some of the omnipresent women, Judy, Anna and Norma, trying to make a few rupiah from their tiny beach shop. 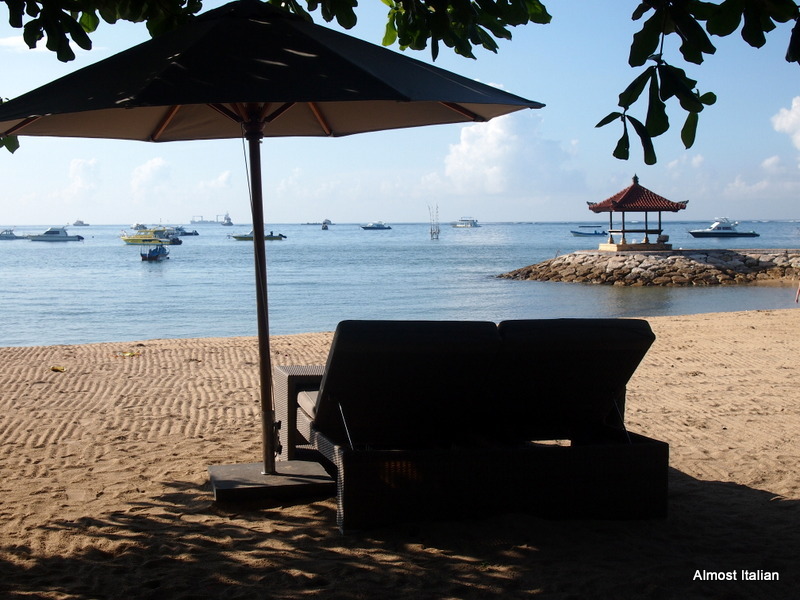 At this time of the year, April, things are very quiet in Sanur. The hotels are half empty and many beach warungs are closed or busy renovating for the season ahead. Some new hotels are being built on the main drag, vulgar looking concrete monoliths designed for those tourists who need to feel insulated from the local environment and its people. At the same time, some overcapitalised international establishments along the beach front have been closed now for some years and the jungle is returning. 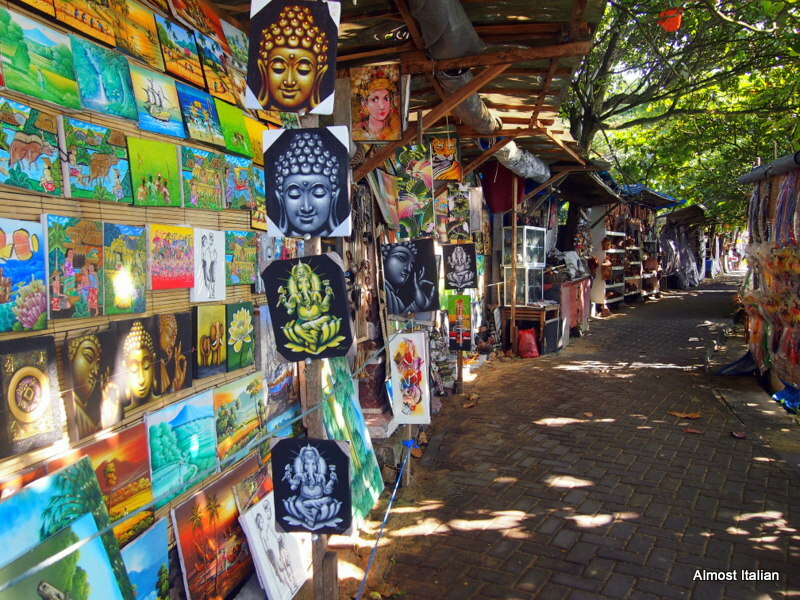 Many of the locals worry that the Europeans have been hit by the GFC and their numbers will continue to dwindle this year, affecting the local Balinese economy. Australians, of course, visit at all times of the year, being only a 6 hour flight away from Melbourne or less from Perth and other cities. The Australian accent is recognisable in any Balinese district, though not as prevalent in the Sanur district as say, Kuta/Legian/Semiyak, a district I no longer visit due to its over commercialisation. Even after 36 years of visiting, Bali still entrances me. This island is Hindu and its culture is alive and well, despite a century of tourism. It is important to keep this in mind when visiting, through appropriate dress and behaviour, and by supporting the local people through the choices we make as tourists. Be mindful where your tourist dollar or euro is going.